It's Thankful Thursday and I'm a bit late in posting today. But better late than never, right? I'm linking up with Laurie at Women Taking a Stand. Today is the National Day of Prayer. How thankful I am to be able to celebrate this day with prayer, despite a US District Judge in Wisconsin's attempt to declare it unconstitutional. I believe our country needs prayer. 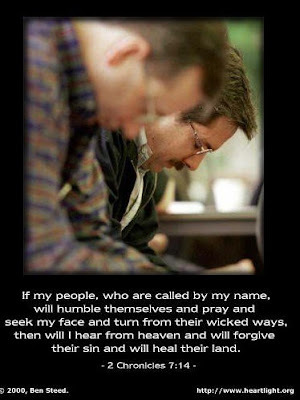 As Christians, we can pray for our country and government leaders. God is sovereign but He gives us the privilege to come before Him in prayer. How awesome is that? As I read this Scripture from 2 Chronicles, what stands out to me besides the act of praying is ..."and turn from their wicked ways". Today I listened to Blog Talk Radio and Kristen Schiffman was our host. You may know her as the editor-in-chief of Exemplify Magazine. She was teaching a series called "Spick & Span ~ Becoming a Woman Who May Scale Mount God" and is based on Psalm 24.
Who may ascend the hill of the Lord? Who may stand in His Holy Place? He who has clean hands and a pure heart; who does not lift up his soul to an idol or swear by what is false. Kristen talked about living holy lives. She gave an example of a little boy who was walking through Target being mischievious. He would knock down things in the aisle like plastic items but knew not to knock down glass items that would break. It's not unusual for us to reason away our plastic sin items as they don't break like glass. But sin is sin and over time ...it leaves a mess. Christ's blood through the will of His Father enables us to have clean hands. Our actions do matter. Faith expresses itself through actions. How thankful I am for that faith that He gives to me. I have been given the freedom of choice. I can choose to obey God or satisfy my own desires. This goes right along with what I'm learning in Ann Spangler's "Praying the Names of God ". The focus for this week is on God as a Consuming Fire, a Jealous God. God is holy and righteous. Thankfully, I can come before Him because of the righteousness of Jesus. He paid the penalty for my sins. But in response I want to grow in holiness; to see things in light of His standard not the world's or my friends. God is also a jealous God. He knows that I will never be satisfied until I return His love passionately. How often I seek after things that do not satisfy? But God continues to pursue me. How thankful I am that He never gives up on me. Do you take your freedom for granted? Many who oppose the Gospel may try to take those freedoms away. Let's stand together and pursue Godly living. Let our actions of love speak to those who do not know our God. It has surprised me that as I've gone online throughout the day I haven't seen any MSN headlines about the National Day of Prayer. I'm joining everyone else in lifting up our country and leaders. I remember hearing someone say: "Sin will take you where you never intended to go, and keep you longer than you ever intended on staying." What a great day, a great reminder of our need for repentance - individually, nationally and globally! I think it is so awesome to know how many people are praying today! Your third bullet point really stood out to me: "Christ's blood frees us up to serve the Living God. (Hebrews 9:14)" So often we can feel unworthy to serve. We are stuck comparing ourselves to others whom we perseive to be more acceptable to God than we are. But praise God! Though His sacrifice we are redeemed. What a blessing to welcomed with loving arms by Him. We are free to serve the Living God! Amen! amen! agreeing in prayer with you! Stop by and check out my Mother's Day Giveaway. I'm praying that God would reveal my sins to me and do the same with all of HIS People. To be "prayerful" is one of the things He willed for His children. Dropping by to greet you a Happy Mother's Day. God bless you richly sister. Wonderful...so well said and I heard!!! Our discussions the last few days have been on "sin"...so this went with what we are working through and the results of our "sin".